The noun end occurs over a dozen times in Alice's Adventures in Wonderland. ..."and I wish you wouldn't keep appearing and vanishing so suddenly: you make one quite giddy." They opened all the doors and windows. They sent all the doors and windows to open. 113. mavna syudɨdi nadɨdi kotɬɨdinɛn otni okottɨdi dɛstɛ. And this is really simple. Togetherness is implied with -nɛn. To say otherwise, you would have to add the adverb liya ‘separately’. 112. ŋidi lenɛn tɨŋi dɛga. Often, languages differ in what exact things they encode in their verbs of motion: is it manner (run vs. walk vs. slouch vs. mosey vs. hobble) or direction/aim (ascend, descend, enter, exit, approach, circumambulate). We find that in English, Latin loans tend to incorporate direction and such information, whereas Germanic inherited words tend to just encode the manner of motion. Typologically, these two seem to be the categories of most interest. What if we'd have verbs also encode for environment of movement? In English, we have wade (for walking in water), and sort of trek (often for walking in mountains or wilderness although it seems to increasingly also encode something about the type of walk you're taking: a walk of considerable distance for enjoying nature). But let's code for things like walk in mud, walk in water, walk in a forest, walk in a hilly area,walk in a desert, ...and then the same for run, and for a few others. In one way, it'd tell us quite a bit more about what the culture the language is supposed to present cares to code for. Pip and his dog were great friends. This paraphrases to Pip and the cat (no dogs!) are inside friends. Now, people sɛdɛ and cats tɛndɛ. Either can be used for a combination. Since friends is also a class I noun, I would use sɛdɛ and elevate the cat to personhood. But then, I am a cat person. 110. Pip idɛlnɛn esɛdɛ syanna dɛstɛ. This, I think, is a fitting word for nonsense. Note, that like Finnish, the Y is pronounced like U in French, or Ü in German. My Miresua word is as long as the shorter of the two words, nine letters. The word nonsense occurs seven times in Alice's Adventures in Wonderland. The Queen turned crimson with fury, and, after glaring at her for a moment like a wild beast, screamed "Off with her head! Off--"
"Nonsense!" said Alice, very loudly and decidedly, and the Queen was silent. These are: You go carefully. and A cuppa tea goes to you Q. #109 isn’t really a command or even a polite request. It’s a question. 108. ŋidi tɨŋi mɨdeya ki. 109. mahɨdɛn tɨŋi ŋideya dɛmɛ. And now we are half way to 218! I recently learned about another giant mythical bird and I don't want to omit it from my register! I was reading a couple of books with characters descended from the Huns (Erika M. Szabo's pair of novels in the Guarded Secrets series, currently undergoing revision) and the Turul bird is mentioned. It's a feature of Hungarian mythology. According to Wikipedia (Turul), the word Turul probably has a Turkic origin (togrıl or turgul), meaning a medium to large bird of prey such as a Goshawk or Red Kite. In Hungarian three different ancient words are used to describe different kinds of falcons, one of which is turul. In Magyar myth of the 9th century (which like most early myths were written down at a much later date), Emese was impregnated (either actually or in a dream) by a Turul bird and a stream of water came from her womb, signifying that her son, Almos, would be the founder of a glorious lineage for the Magyar people, which would spread out over the land like a great stream. "In Hungarian myth, the world is divided into three spheres: the first is the Upper World (Felső világ), the home of the gods; the second is the Middle World (Középső világ) or world we know, and finally the underworld (Alsó világ). In the center of the world stands a tall tree: the World Tree / Tree of Life (Világfa/Életfa). Its foliage is the Upper World, and the Turul bird dwells on top of it. The Middle World is located at its trunk and the underworld is around its roots. In some stories, the tree has fruit: the golden apples." If you've been reading my Hercules posts, you know that the idea of a tree bearing golden apples occurs in the myths of many cultures, as does the Tree of Life or World Tree concept. 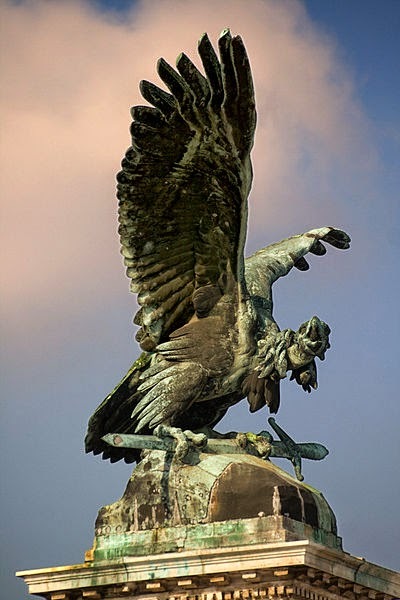 In the article on Turul, Wikipedia states that the Turul became a symbol of power, strength, and nobility and is often portrayed with a sword in its talons. Its image is still used today on the coats of arms of various Hungarian governmental agencies. You are currently browsing the Conlangers blog archives for May, 2014.